The 1887-90 N175 Goodwin & Co. Gypsy Queen Baseball Card set contains approximately 160 cards measuring 1 1/2" x 2 1/2". N175 Gypsy Queen cards are known to exist in a larger size as well, which is more difficult to find. The set looks extremely similar to the Old Judge sets. N175 Cards feature the words "Gypsy Queen" in large letters, predominantly across the top front. Players names are placed below the action pose followed by "Copyrighted by Goodwin & CO 1887 Cigarettes Goodwin & CO, N.Y.". Some of the Hall-of-Famers included in this issue are: N175 Gypsy Queen Buck Ewing, Dan Brouthers, Charles Comiskey, Mike King Kelly and Tim Keefe. 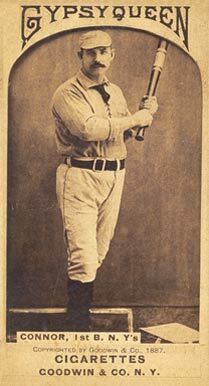 CLICK HERE if you want to sell your 1887-90 N175 Gypsy Queen Baseball Cards.